I recently analyzed a few of the internal Podcasts produced by CNN. One particular installment is yet another example of a major media outlet distributing audio that is in my view unsuitable for this particular platform. The distributed audio is mono, 64kbps, with music elements. I’ve stated how I feel about this. I’m not a proponent of 64 kbps MP3 audio PERIOD (mono or stereo). In general audio in this format sounds horrible. Feel free to disagree. Secondly, the Integrated (Program) Loudness for this particular program is just about -23.0 LUFS with a Maximum True Peak of +0.40 dBTP. From my perspective the perceptual Loudness misses the mark. And, the audio is clipped. Lastly, the produced audio is way too dynamic for spoken word. The perceptual inconsistency of the delivery by the participants is inadequate when considering how (for the most part) this program will be consumed (mobile devices, problematic ambient spaces, etc.). Again, the distributed file is mono. 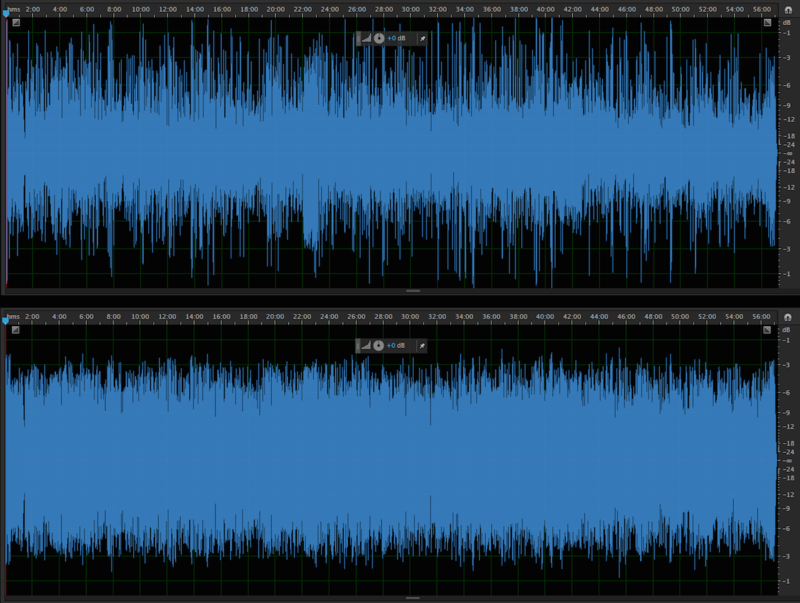 The recommended Integrated Loudness Target for mono Podcasts is -19.0 LUFS. This is the perceptual equivalent of -16.0 LUFS stereo. If I were to apply a +4 db gain offset to Loudness Normalize this audio to -19.0 LUFS, there would be very little change in the original dynamic structure of the audio. However without some form of aggressive limiting, the maximum amplitude or Peak Ceiling would be driven into oblivion. In fact audible distortion may occur with or without limiting. This is obviously not recommended. There are two options to consider: 1) apply Dynamic Range Compression before Loudness Normalization, or 2) shoot for a lower Integrated Loudness target. For this particular example I chose to implement both options. First, in my view optimizing the dynamics in this program for Podcast distribution is unavoidable. It’s just way too choppy and it lacks delivery consistency for spoken word. Also, by lowering the L.Normalized Target, the necessary added gain offset will be reduced resulting in less aggressive limiting. In addition, the reduced amount of added gain will curtail noise floor elevation and other variables such as exaggerated breaths. As noted the distributed Podcast (displayed in the attached upper waveform example) checks in at -23.0 LUFS and it is clipped. My optimized version (displayed in the lower waveform example) checks in at -20.2 LUFS with a Maximum True Peak of -1.23 dBTP. It is well within a reasonable level of Program Loudness tolerance for Podcast L.Normalization. 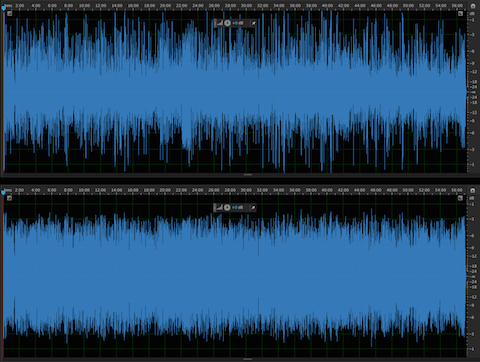 In fact the perceptual difference between the processed -20.0 LUFS audio and a -19.0 LUFS version would be pretty much undetectable. In essence the audio has been optimized and it exhibits improved intelligibility. It is now well suited for Podcast distribution. (If you are interested in the tools that I use, they are listed under Available Services). It is no secret that I am a staunch proponent of the -16.0 LUFS/-19.0 LUFS recommendations for Podcasts. However, in certain situations – tolerance for slightly reduced Program Loudness Targets is acceptable. For the record – my remaster is much easier to listen to. CNN can do better. Two copies of an audio file. 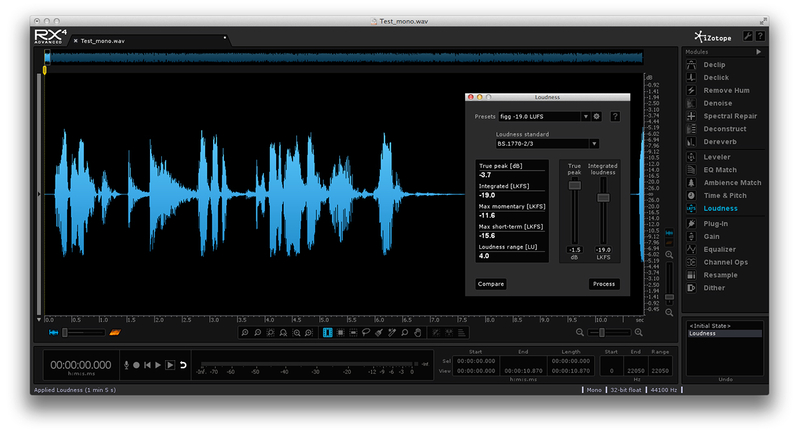 File 1 is Stereo, Loudness Normalized to -16.0 LUFS. File 2 is Mono, also Loudness Normalized to -16.0 LUFS. Passing both files through a Loudness Meter confirms equal numerical Program Loudness. 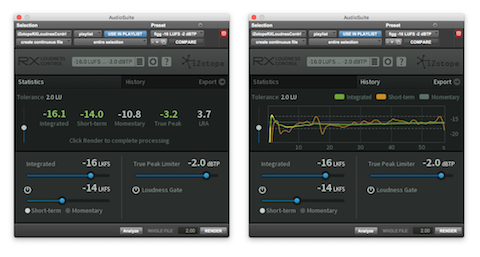 However the numbers do not reflect an obvious perceptual difference during playback. In fact the Mono file is perceptually louder than it’s Stereo counterpart. Why would the channel configuration affect perceptual loudness of these equally measured files? I’m going to refer to a feature that I came across in a Mackie Mixer User Manual. Mackie makes reference to the “Constant Loudness” principle used in their mixers, specifically when panning Mono channels. On a mixer, hard-panning a Mono channel left or right results in equal apparent loudness (perceived loudness). It would then make sense to assume that if the channel was panned center, the output level would be hotter due to the combined or “mixed” level of the channel. In order to maintain consistent apparent loudness, Mackie attenuates center panned Mono channels by about 3 dB. A Mono file played back through two speakers (channels) in a DAW would be the same as passing audio through a Mono analog mixer channel panned center. In this scenario, the analog mixer (that adheres to the Constant Loudness principle) would attenuate the output by 3dB. 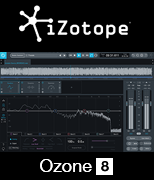 In order to maintain equal perception between Loudness Normalized Stereo and Mono files targeting -16.0 LUFS, we can simulate the Constant Loudness principle in the DAW by attenuating Mono files by 3 LU. 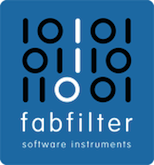 This compensation would shift the targeted Program Loudness for Mono files to -19.0 LUFS. To summarize, if you plan to Loudness Normalize to the recommend targets for internet/mobile, and Podcast distribution … Stereo files should target -16.0 LUFS Program Loudness and Mono files should target -19.0 LUFS Program Loudness. Note that In my discussions with leading experts in the space, it has come to my attention that this approach may not be sustainable. Many pros feel it is the responsibility of the playback device and/or delivery system to apply the necessary compensation. If this support is implemented, the perceived loudness of -16.0 LUFS Mono will be equal to -16.0 LUFS Stereo. There would be no need to apply manual compensation.